I spent an uneventful night in Port Elizabeth, and was off the next morning to Buccaneers, a hostel on the western edge of the Wild Coast. The wine volleyball game that greeted me that first afternoon quickly ensured the hostel would become one of my favorites to-date. While Buccaneers was good for a party, my next stop was an eco-lodge/hostel called Bulungula. 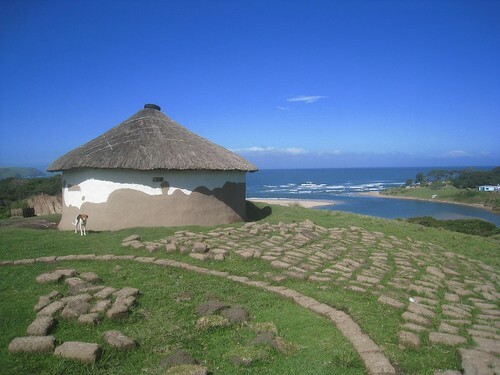 Also set on the coast, and within a Xhosa village, it was well worth the effort it took to get there (and then back out again). Gotta say Gary, I think you should get back out there and explore the world again. I really loved reading your blog – I started following you in newzealand – but recently I've sort of lost interest. Sorry! But the friday flashbacks sort of remind me of how excited I used to be when I noticed you had a new post. I appreciate your candor, and trust me, I’d like to get back out there on another adventure as well. In the 9 months I’ve been home, I have taken several trips to New York City, and I went to Rwanda in late March. I also just got back from my first trip to Los Angeles, and intend to write about that as well. Some people are more comfortable traveling by the skin of their boot than others. As for the rest of us, it’s common to take time off between trips (regardless of length) to reflect, work, save some more money, and ultimately get back out there. Oh wow, that place looks just PERFECT!! !